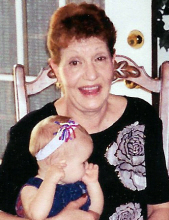 Jimmie Lynn Hughes 75, passed away late Sunday February 17, 2019 in Tulsa. She was born on February 5, 1944 in Vinita to James and Lillian (Freeman) Bankhead. Jimmie was married to Larry Hughes who preceded her in death. She was a member of the Family Praise Center in Vinita. Jimmie had worked many years as a haridresser. She loved her grandchildren and working in the garden. The family includes; her children; Stacey Hughes and wife Dana of Carthage, MO, Deidre Bickell of Ft. Smith, AR, Scott Hughes and wife Susan of Vinita, Brian Hughes of Vinita, Donnie Hughes of Vinita; 16 grandchildren and 9 great-grandchildren; numerous nieces, nephews, cousins and friends. The Memorial service will be held on Wednesday, February 20, 2019 at 3:00 PM at the Burckhalter-Highsmith Funeral Home, with Pastor Jerry Ogdon officiating. Arrangements are by the Burckhalter-Highsmith Funeral and Cremation Services of Vinita. www.highsmithfh.com. To send flowers or a remembrance gift to the family of Jimmie Lynn Hughes, please visit our Tribute Store. "Email Address" would like to share the life celebration of Jimmie Lynn Hughes. Click on the "link" to go to share a favorite memory or leave a condolence message for the family.